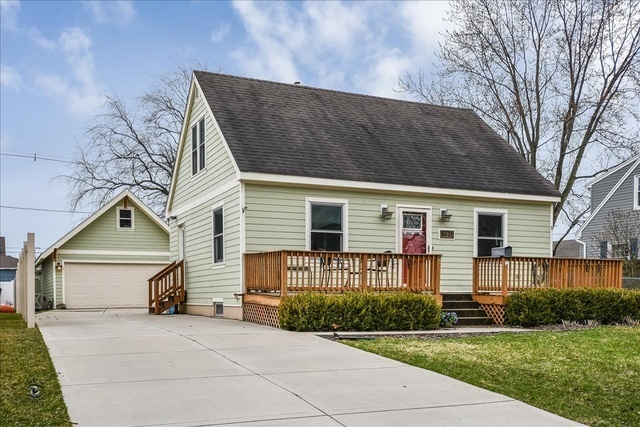 Beautiful 3 Bedroom Cape Cod Home on Quiet Street, Walking Distance to Downtown Tinley Park. The Home Features an Updated Kitchen with Classic White Cabinet, Stainless Steel Appliances and Ceramic Floor. Hardwood Floors Stretch Throughout the Large Dining Room, Cozy Family Room and 1st Floor Bedroom. Other Features Include 1st Floor Full Bath, 2 Large 2nd Floor Bedrooms and Full Partially Finished Basement. The 4 Car "Extra Deep" Garage was Built New in 2008 and has a Dedicated 100 Amp Electrical Service perfect for Hobbyist or Mechanics and a Huge Upper Level Storage Area. Enjoy Entertaining in the Partially Fenced Back Yard with Plenty of Green Space. New Siding 2011, New Marvin Wood/Aluminum Clad Windows 2011, New A/C 2014, Tankless Water Heater, New Concrete Driveway 2015, Freshly Painted and New Carpets. Located Walking Distance to Oak Park Ave. Metra Train, Restaurants, Shopping and Minutes to I-80/I-57.